I wanted a quick project before attacking yet another dress. The summer is still not coming and we are wearing sweaters and coats, but I figured out that I should be ready for the high temperatures when they come. Last year it was quite difficult to find shorts for my summer vacation, most of all because I am not used to buying trousers at all and finding the correct fit is far from easy. 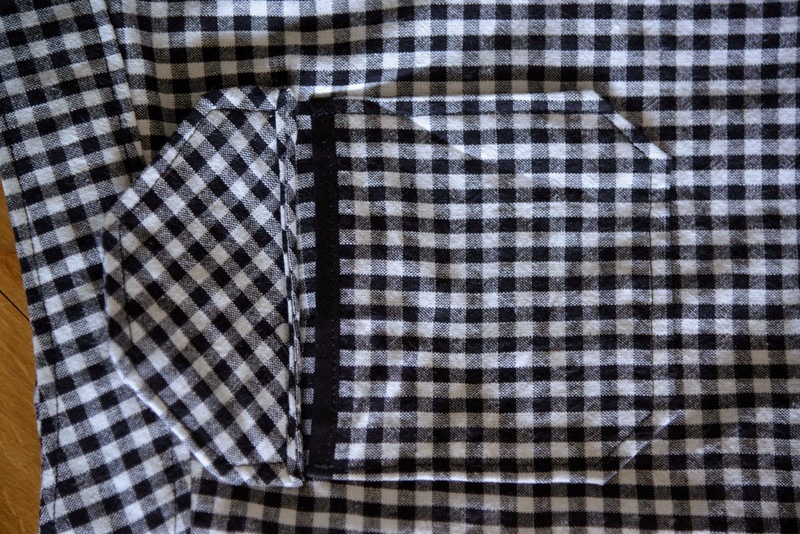 I have seen the Burdastyle Ruby shorts in a vintage version on Wesewretro.com and thought the black&white combination was actually a good plan. The original pattern is Burdastyle Ruby 6005. As I have totally no idea on the Burda trousers fit, I sew up a quick muslin and realized that it did not fit AT ALL. I ended up taking my favorite winter short and adjusting the pattern according to it. 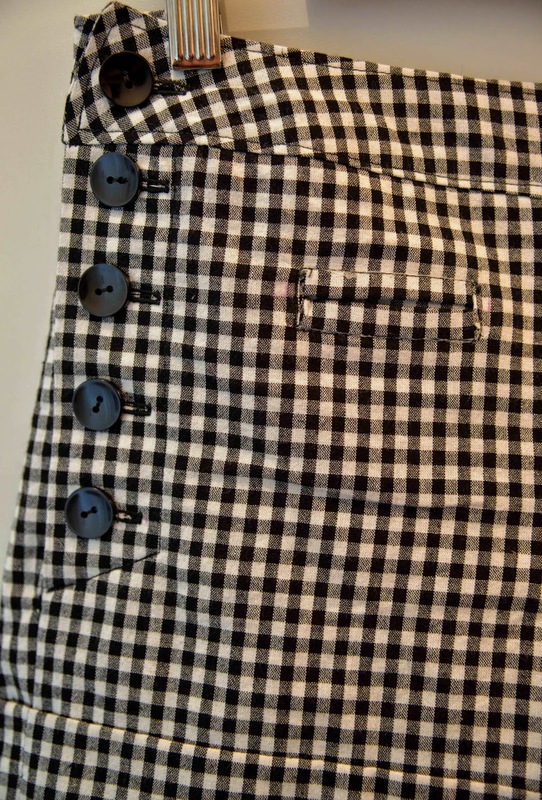 Basically, I only kept the idea of side button closing, the waistband and the pockets. Another quite disturbing thing was the included seam allowance. 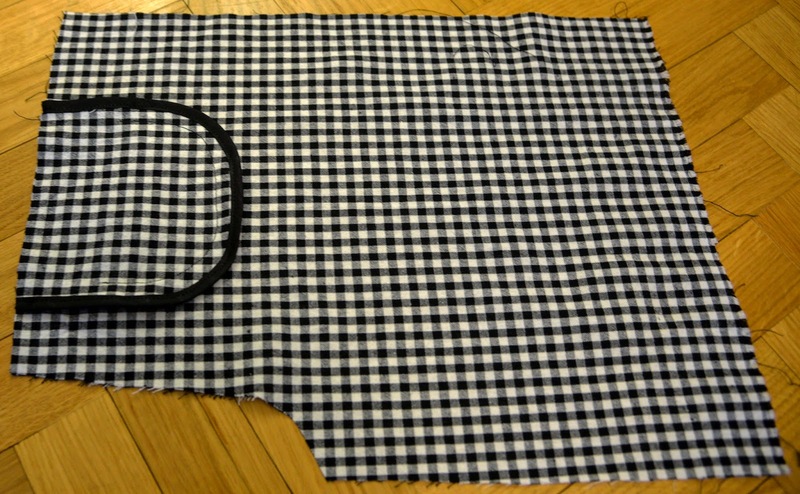 Usually, I tend to cut little less than the 1.5 cm seam allowance, but I count with the same when sewing. Not having the seam lines marked on the fabric was somehow strange. As I redid the pattern, I got rid of the seam allowances and worked my usual way. I might not be a fan of pockets on skirts and dresses, however, on my shorts I did not hesitate a minute. The Burda shorts have one welted and one pouch pocket, so there we go, two things to learn on one project. The instructions for the welted pocket were totally incomprehensible to me so I ended up watching a tutorial on Youtube to clarify the problematic. 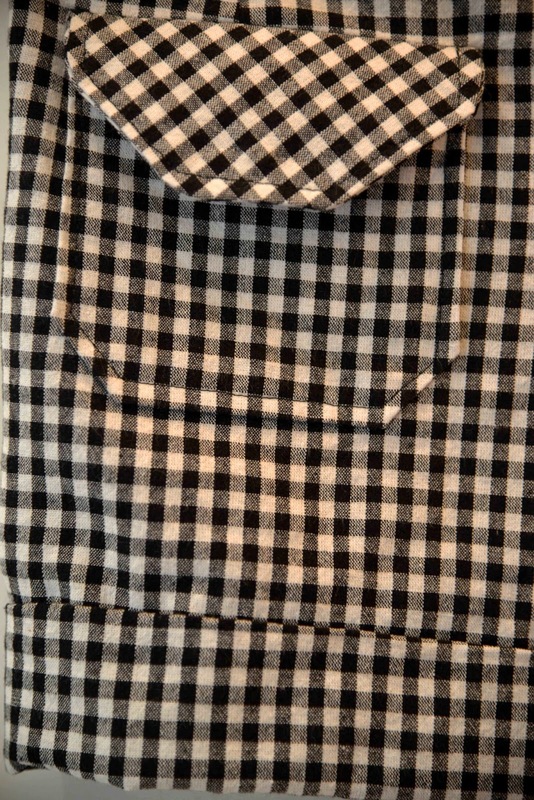 I realize that I could have done even better in pattern-matching, but basically I think the pockets are pretty neat. From the outside, as well as from the inside. Ok, they might not be very large, but a metro ticket gets in. As for the pouch pocket, that was much easier to sew and match correctly on the shorts. With the same detail inside. 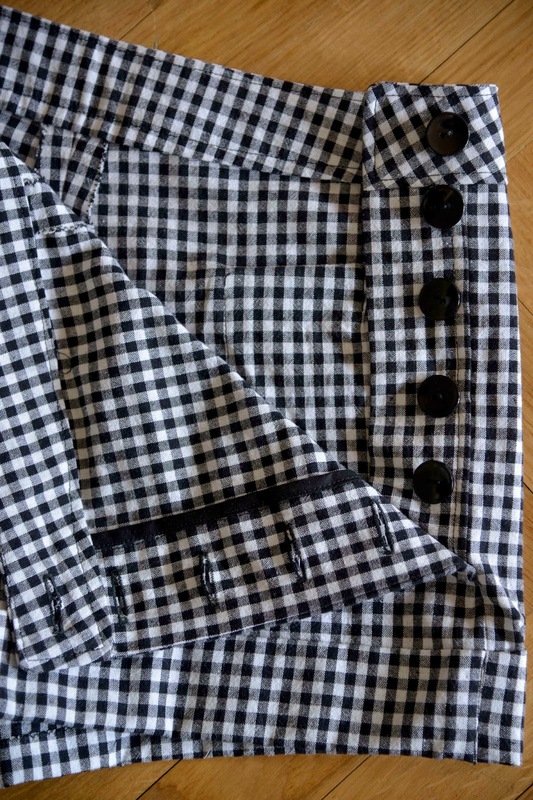 The pouch pockets, the button closings and the waistband asked for topstitching. I am not used to that but just following the pattern helped me a lot to make clear lines. Then comes the story of buttonholes. So far, I have not managed to sew a complete buttonhole on my machine which is supposed to be fully automatic. It was out of question not to do it in this case: there are 10 buttons on the shorts! Going back to google and to the machine manual I thought doing everything correctly, nothing helped, the machine got the left part correctly, only to continue straight on the right side. After an hour of desperation, I found 2 Dutch videos which showed ALL the settings in detail, and there I had it: the complete buttonhole done in a few seconds. All ten in 5 minutes, yohoooo. 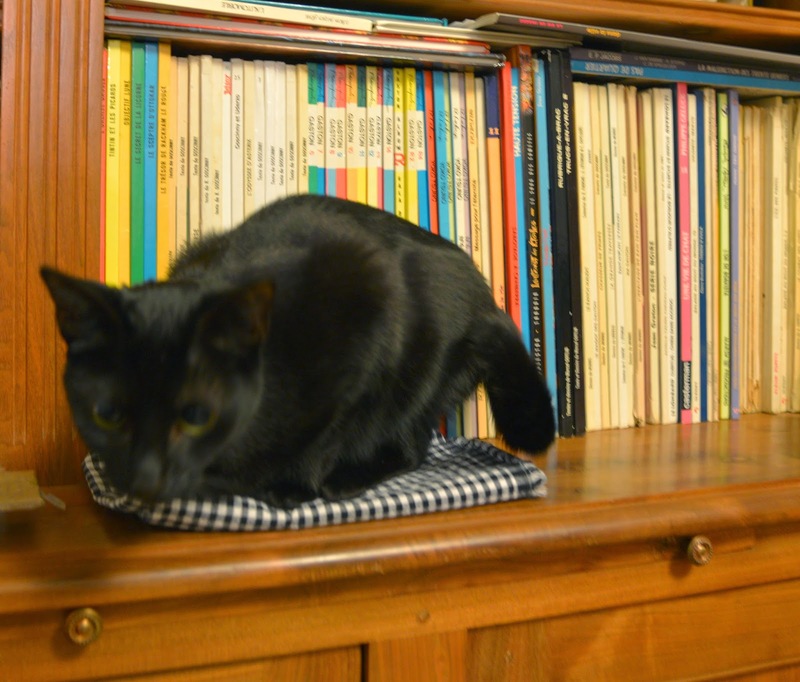 and redo the whole thing, including the topstitching. 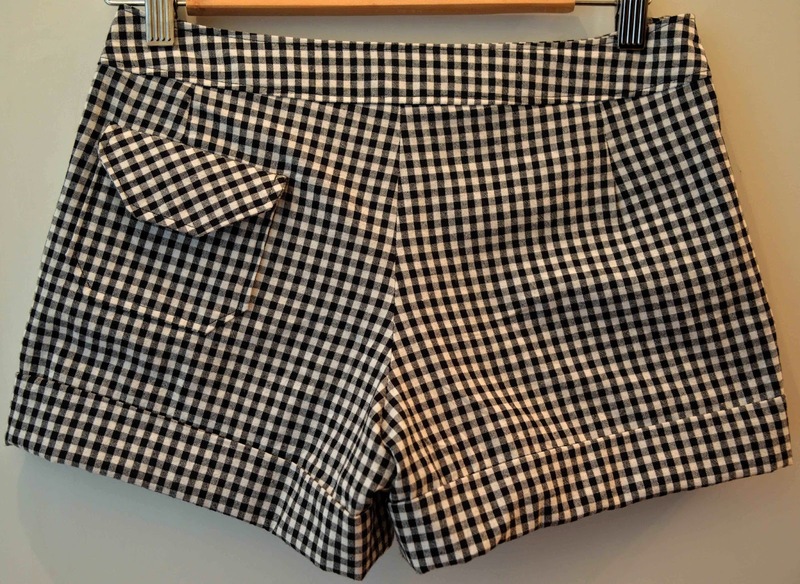 In the end, the shorts took me some time to finish, due to the form adjusting, numerous details and my big mistake, but it is good to know that I do have nice and simple shorts pattern which I will do again for sure. These fit you great! I always have such a hard time finding pants and shorts that fit right! But I've never tried to tackle sewing my own because I feel like getting the fit right sewing would be a bigger hassle than getting the fit right shopping! These look phenomenal though, so chic! Thank you! The fit is just so much better than in RTW.